The group also told the Court of Session they wanted to cite the Queen as a witness. Jesus Christ has returned to Earth and he wants a judge to stop the eviction of independence campaigners camped outside the Scottish Parliament, a court has heard. Members of the Sovereign Indigenous Peoples of Scotland group, who are camped outside the Parliament, also tried to cite the Queen as a witness at the Court of Session on Tuesday. The group wish to remain outside the parliament so they can continue their "spiritual" vigil despite a bid from the Scottish Parliament Corporate Body to evict them. Campaigner Richard McFarlane told the court he had spoken to Jesus and said the independence camp wants the Stone of Destiny to be used in a "coronation" ceremony for Christ. Mr McFarlane said: "We have spoken to Jesus, who is here for his second coming, and he would like you to stop this if you can, please. "If it is in your power could you please leave the indy camp alone. Christ is here on his second coming. "We are having a spiritual vigil. We want to be free of debt and free of war. So if you can stop this, please do." 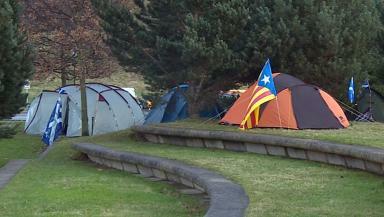 The camp was set up on the parliamentary estate in November 2015, with the campers citing the devolution-era Democracy for Scotland vigil as inspiration. The corporate body wants the group to be removed, saying they are taking up space without permission and could be compromising the political neutrality of the area. The hearing on Tuesday was supposed to hear about the campaigners' attempts to secure lawyers for their cause. The campers were told by Lord Turnbull in May to find lawyers who would argue their case on human rights grounds. Mr McFarlane also told the court he and his fellow campaigners contacted 144 lawyers but all said they would be unable to represent them. He also told Lord Turnbull: "The Lord communicated to me to tell you that we love you, sir." Mr McFarlane also told the court that he wanted to call the Queen as a witness. During proceedings, Lord Turnbull rebuked Mr McFarlane for not sticking to legal points and for making "philosophical" and "spiritual" arguments that could not be properly examined by the court. Another campaigner, Arthur Gemmill, accused the judge of committing blasphemy. Mr Gemmill said Lord Turnbull had "ridiculed" his belief in God. When asked to substantiate this claim, Mr Gemmill said he could not find the insult in a written judgement which had been issued by the court at an earlier date. The campaigners wanted more time to try to find a lawyer who will represent them but Lord Turnbull refused this saying there was "no realistic prospect" of them finding legal representation. The Scottish Parliament's advocate Gerry Moynihan QC opposed the citing of the Queen as a witness. At the end of proceedings, Lord Turnbull criticised the conduct of the indy campers in the way that they presented their case. He criticised Mr Gemmell for making unfounded allegations about Lord Turnbull blaspheming against God. The judge also said that he wasn't going to prosecute Mr Gemmell for contempt of court. But he said the pair had "strayed" outside the bounds of the case and their conduct was "unacceptable." He rejected the campers' bid to cite the Queen as a witness on grounds of relevancy. The judge then fixed another hearing to take place on June 29, 2016.